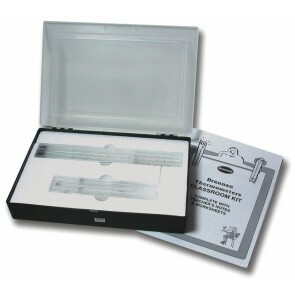 Thermometer kits that have been developed for use in the classroom supplied complete with teaching notes and photocopiable worksheets. Our school thermometer range is ideal for teaching children about temperature and the different ways in which it can measured. 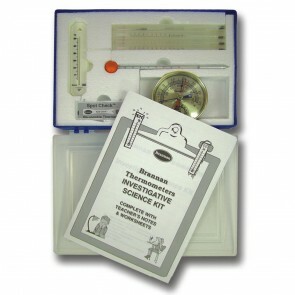 These classroom-based thermometer kits are ideal for use in the science lab or for investigative projects in geography and more general learning themes. • Counting in increments other than ones. • Using formulae to convert temperatures between the different temperature scales. It will also encourage an interest in daily weather conditions and how temperatures differ depending upon the season. The large classroom thermometer is aimed at providing a daily demonstration of how temperature is affected by the seasons. Our teaching thermometer kits include traditional spirit thermometers and dial thermometers (bimetal thermometers), along with teaching notes. 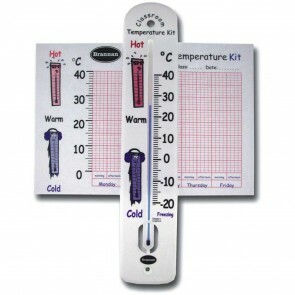 School thermometers can also be integrated into lessons on the environment or weather. They allow children to get involved in lessons in a practical way. Min/max thermometers can be left in the playground and will show the range of temperatures over a given period. Soil thermometers can be used to show how the temperature below the ground changes at a different rate to the air temperature.